Free Shipping for Sellers. Any Shoe. Anywhere. All Weekend. We think everyone will agree that the Complex x StockX Sneaker Madness is super awesome for people looking to buy sneakers right now. Where else are you going to have the chance to buy 64 pairs of amazing sneakers at their original retail price or less? The answer is nowhere. Click HERE to get your Bids in. Just yesterday we added eight more pairs including three pairs of Yeezy V2s and the Jordan 10 OVO in black. Yes, seriously. The other question you’re probably asking yourself is, “Self, what about all those people trying to SELL sneakers on StockX right now?” Don’t worry, we have a super simple answer to that question so you can pay more attention to the things that have been organized into brackets this month and stop talking to yourself. 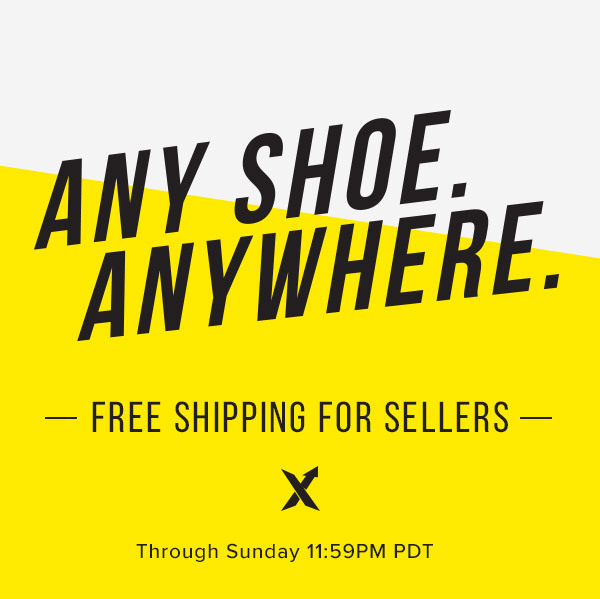 Anyone who sells a pair of sneakers between Friday, March 24th at 3:00 pm EDT until Sunday, March 26th at 11:59 pm PDT will have their pairs ship to StockX for free. Again. Yes, seriously. It’s Free Shipping for ALL sellers in the United States, Canada, Australia and the UK. Go get your Asks live! Here are the important details that we hope you read, even though we probably already lost you at “pairs ship to StockX for free”. Free shipping is only applicable for pairs of sneakers that are sold between 3:00 pm EDT on 3/24/2017 until 11:59 pm PDT on 3/26/2017. IMPORTANT: 11:59 pm PDT on 3/26/2017 = 3:00 am EDT on 3/27/2017. If you sell any pair sold BEFORE 3:00 pm EDT on 3/24/2017 or AFTER 11:59 pm PDT on 3/26/2017, you will be charged your normal shipping rate, regardless of when the Ask was placed. StockX will determine whether or not a trade is eligible for free seller shipping based on the official time stamp of when the transaction happens in our system. This promotion is available to all sellers on StockX who are located in the United States, Canada, Australia and the UK. Every pair sold during this promotional period will ship to StockX for free. There is no limit (soldiers!) to the amount of pairs you can sell during this promotional period. All other selling fees and payment processing fees apply during this promotion. Free shipping is not available to the buyers of sneakers during this promotion, only the sellers. Every product on StockX is eligible for free seller shipping during the promotional period. @AreesMomin Hey Arees, please reach out to [email protected] with details regarding this, and we'll follow up as soon as we can. Thanks! @StepIntoMyZone Hey Humphrey, can you please provide your StockX username? Thanks!